“Jaguar Jon” received All-American recognition from the AP, NEA, and Football Writers Assoc. of America in 1955 and was recipient of the Voit Trophy as top college football player on the Pacific Coast in 1954 and ’55. His senior year was limited to five games due to NCAA sanctions that were leveled against USC. Arnett was a natural choice for the Rams in the first round of the ’57 NFL draft (second overall). His speed, agility, and outstanding running instincts made him a fit both at halfback and as a kick returner. Rams went 6-6 to finish fourth in the NFL Western Conference while leading league in total yards (4143), rushing yards (2142), and scoring (307 points). 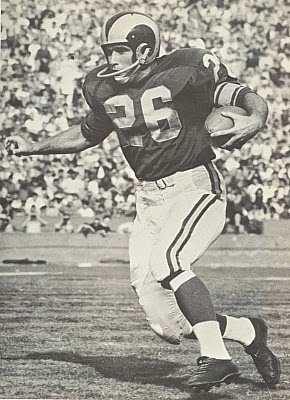 Arnett was chosen to the Pro Bowl following each of his first five seasons and was a consensus first-team All-NFL selection in 1958 when he had career highs in rushing yards (683), pass receiving yards (494, on 35 catches), yards from scrimmage (1177), and all-purpose yards (1731) and he led the league in punt return yards (223) and average (12.4). He was used more as a spot player over the years, lining up at both halfback and flanker while continuing to return kicks. In 1961 Arnett received second-team All-NFL honors from the NEA, UPI, and New York Daily News in a year in which he ran the ball 158 times, his highest total, for 609 yards, gained 1531 all-purpose yards, and returned a kickoff 105 yards. Injuries became a factor in 1962 and ’63, and he was traded to the Chicago Bears prior to the 1964 season, having gained 8076 all-purpose yards in seven years with the Rams (2892 rushing, 1911 receiving, 683 on punt returns, and 2590 returning kickoffs). Arnett led the Bears with 400 rushing yards in ’64 but the arrival of rookie HB Gale Sayers in 1965 relegated him to a backup role in his last two seasons. Overall, Arnett rushed for 3833 yards on 964 carries (4.0 avg. ), caught 222 passes for 2290 yards, averaged 8.2 yards on 120 punt returns and 24.7 yards on 126 kickoff returns. He scored a total of 39 touchdowns and was named to five Pro Bowls. Arnett was chosen to the USC Athletic Hall of Fame in 1994 and the College Football Hall of Fame in 2001.